The Dukes of Hazzard was an American action-comedy television series that aired on CBS from January 26, 1979, to February 8, 1985. The show aired for a total of 147 episodes spanning seven seasons. The series was inspired by the 1975 film Moonrunners, which was also created by Gy Waldron and had many identical or similar character names and concepts. 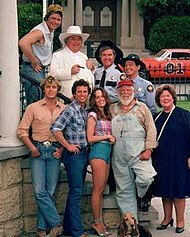 The Dukes of Hazzard had an ensemble cast, which follows the adventures of "The Duke Boys", cousins Bo Duke (John Schneider) and Luke Duke (Tom Wopat) (including Coy and Vance Duke for most of season 5), who live on a family farm in fictional Hazzard County, Georgia, with their attractive female cousin Daisy (Catherine Bach) and their wise old Uncle Jesse (Denver Pyle). The Duke boys race around in their customized 1969 Dodge Charger stock car, dubbed (The) General Lee, evading crooked and corrupt county commissioner Boss Hogg (Sorrell Booke) and his bumbling and corrupt Sheriff Rosco P. Coltrane (James Best) along with his deputy(s), and always managing to get caught in the middle of the various escapades and incidents that often occur in the area. Bo and Luke had previously been sentenced to probation for illegal transportation of moonshine; their Uncle Jesse made a plea bargain with the U.S. Government to refrain from distilling moonshine in exchange for Bo and Luke's freedom. As a result, Bo and Luke are on 5 years probation and not allowed to carry firearms – instead, they often use compound bows, sometimes with arrows tipped with dynamite – or to leave Hazzard County unless they get probation permission from their probation officer, Boss Hogg, although the exact details of their probation terms vary from episode to episode. Sometimes it is implied that they would be jailed for merely crossing the county line; on other occasions, it is shown that they may leave Hazzard, as long as they are back within a certain time limit. Several other technicalities of their probation also came into play at various times. It was largely filmed in Hidden Valley in Thousand Oaks, California, with scenes also shot at nearby Lake Sherwood and also at Paramount Ranch in nearby Agoura Hills. Luke Duke (Tom Wopat) is the dark-haired, older Duke boy. More mature and rational than his cousin Bo, he is typically the one who thinks of the plan that will get the two out of whatever trouble they have got into. Luke wears a checked blue shirt (a plain blue shirt in most, though not all, second-series episodes) and a denim jacket over it in first season and a few later second-season episodes. He is a veteran of the United States Marine Corps and a former boxer. Luke was the first Duke to perform the "hood slide" across The General Lee, which is seen in the opening credits of the show (a shot taken from the second episode, "Daisy's Song"). According to Tom Wopat the slide was an accident, because his foot got caught on the side of the General Lee when he attempted to jump across the hood; he also caught his arm on the hood's radio antenna, resulting in such antennas being removed from later versions of the General Lee. However, the "hood slide" quickly proved popular and became a regular staple of episodes. The only episode to directly reference the age difference between Luke and Bo is in the seventh season opener, the "flashback" episode "Happy Birthday, General Lee," where it is stated that Luke had already been in the Marines while Bo was in his last year at high school. Though Bo and Luke share the CB call sign "Lost Sheep," in the Season One episode "Money to Burn," Luke refers to himself (singularly) as "Sittin' Duck". Boss Jefferson Davis "J.D." Hogg (Sorrell Booke) is the wealthiest man in Hazzard County and owns most of its property and businesses — whether directly or by holding the mortgages over the land. Usually dressed in an all-white suit, he is the fat, greedy, corrupt County Commissioner with visions of grandeur, a voracious appetite for food, who constantly orders Rosco to "Get them Duke Boys!" He is also Bo and Luke's probation officer; when Bo and Luke need to leave Hazzard they always get permission from him. Boss Hogg is also married to (and dominated by) Rosco's "fat sister" (Lulu Hogg), a point that does not always sit well with either Boss Hogg or Rosco; Hogg sometimes claims that Rosco is indebted to him because of it, though his on-screen interactions with Lulu typically show him loving her deeply (and giving in to her stronger personality). In addition to his role as county commissioner he is also the police commissioner, land commissioner, and bank president. Boss is also the chief of the Hazzard Fire Department and the owner of or primary mortgage holder on most of the places in the county, including the Boar's Nest, Rhubottem's Store, Cooter's garage and the Duke Farm. It is implied in some episodes that he is the Justice of the Peace but in others Hazzard relies on a circuit judge. In the episode "Coltrane vs. Duke", Hogg represents Rosco when he sues the Dukes, implying that he is a licensed attorney. His vehicle is a white 1970 Cadillac Coupe de Ville convertible, with bull horns mounted on the hood. In the first few seasons, he is almost always driven around by a chauffeur. His old moonshine-running car was called the "Grey Ghost". Every morning, Boss Hogg would drink coffee and eat raw liver (Sorrell Booke, a method actor, actually ate the raw liver). Boss Hogg is described in one analysis as "an ineffectual bad guy--hence amusing". Flash (Sandy and others) is a slow-paced basset hound and Rosco's loyal companion, who hates Hogg but loves the Dukes. She first appeared in the first official third-season episode "Enos Strate to the Top" (season opener "Carnival of Thrills" was held over from the previous season), although was not formally "introduced" in that episode. Initially referred to as a boy, Flash is later regularly a girl (despite an occasional male reference afterwards). Flash was added at the start of the third season, after James Best suggested to the producers that Rosco have a dog. Rosco doted on Flash, often calling her "Velvet Ears". Flash was portrayed by several basset hounds (distinguishable by different facial colors), the most regular being "Sandy". James Best bought a share of Sandy, who was rescued from an animal shelter and was trained by Alvin Mears of Alvin Animal Rentals. Sandy lived to age 14. A stuffed dog named Flush was used for dangerous work. The Dukes of Hazzard was consistently among the top-rated television series (at one point, ranking second only to Dallas, which immediately followed the show on CBS' Friday night schedule). With that success came huge profits in merchandising, with a wide array of Dukes of Hazzard toys and products being licensed and becoming big sellers. However, over the course of the show's fourth season, series stars Tom Wopat and John Schneider became increasingly concerned about a contract dispute over their salaries and merchandising royalties owed to them over the high sales of Dukes products. Neither of them were being paid what was owed to them and this became very frustrating to the duo. As a result, in the spring of 1982, as filming was due to begin on the fifth season, Wopat and Schneider did not report to the set in protest over the matter. Catherine Bach also considered walking out due to similar concerns, but Wopat and Schneider convinced her to stay, insisting that if she left then there might not be a show to come back to, and that settling the issue was up to them. Production was pushed back by a few weeks as fairly similar looking replacements were subsequently, hastily hired: Byron Cherry as Coy Duke and Christopher Mayer as Vance Duke. Bo and Luke were said to have gone to race on the NASCAR circuit; how they managed to do this, bearing in mind the terms of their probation, was never explained. Cherry and Mayer were originally contracted at just 10 episodes as stand-ins, still with hope that a settlement might be reached with Wopat and Schneider (in total, they made 19 episodes including one with Bo and Luke). Some scripts for Coy and Vance were originally written for Bo and Luke but with their names quite literally crossed out and Coy and Vance penned in. The new Dukes — previously-unmentioned nephews of Uncle Jesse, who were said to have left the farm in 1976, before the show had started — were unpopular with the great majority of viewers, and the ratings immediately sank. Much of the criticism was that Coy and Vance were nothing but direct clones of Bo and Luke, with Coy a direct "carbon copy" replacement for Bo and Vance for Luke, with little variation in character. This was something that even show creator Gy Waldron has said was wrong, and that he insisted, unsuccessfully, that audiences would not accept direct character clones and the two replacements should be taken in a different direction characterwise, but was overridden by the producers. Waldron also commented that if Bach too had walked, the show would have most probably been cancelled. It was reported that prior to filming, Cherry and Mayer were given Bo and Luke episodes to watch, to study and learn to emulate them, although Cherry has said in interviews that he does not recall this ever happening. Hit hard by the significant drop in ratings, Warner Bros. renegotiated with Wopat and Schneider, and eventually a settlement was reached, and the original Duke boys returned to the series in early 1983, four episodes from the conclusion of the fifth season. Initially, part of the press release announcing Wopat and Schneider's return suggested that Cherry and Mayer would remain as part of the cast (though presumably in a reduced role), but it was quickly realized that "four Duke boys" would not work within the context of the series, and due to the huge unpopularity associated with their time on the show, they were quickly written out of the same episode in which Bo and Luke returned. Although Coy and Vance were never popular with the majority, a few viewers were disappointed by their departure episode, "Welcome Back, Bo 'N' Luke", which was for the most part a standard episode, with the return of Bo and Luke and the departure of Coy and Vance tacked onto the beginning (Bo and Luke return from their NASCAR tour just as Coy and Vance leave Hazzard to tend to a sick relative). Even a few viewers commented that they were disappointed by this, and that they would have liked to have seen both pairs of Duke boys team up to tackle a particularly dastardly plot by Boss Hogg before Coy and Vance's departure, but as it turned out, Coy and Vance had little dialogue and were gone by the first commercial break, never to be seen or mentioned again. While the return of Bo and Luke was welcomed by ardent and casual viewers alike, and as a result ratings recovered slightly, the show never completely regained its former popularity. One of Wopat and Schneider's disputes even before they left was what they considered to be increasingly weak and formulaic scripts and episode plots. With Wopat and Schneider's return, the producers agreed to try a wider scope of storylines. However, although it continued for two more seasons, the show never fully returned to its former glory. Many cast members[who?] decried the miniature car effects newly incorporated to depict increasingly absurd General Lee and patrol car stunts (which had previously been performed with real cars by stunt drivers). The miniature car effects were intended as a budget saving measure (to save the cost of repairing or replacing damaged vehicles) and to help compete visually with KITT from the NBC series Knight Rider. In February 1985, The Dukes of Hazzard ended its run after seven seasons. The General Lee was based on a 1969 Dodge Charger owned by Bo and Luke (the series used mostly 1969 Chargers in the beginning; later on, they also modified 1968 Chargers to look like 1969s by installing 1969-model taillamps, taillamp panels, and grilles). It was orange with a Confederate battle flag painted on the roof, the words "GENERAL LEE" over each door, and the number "01" on each door. In the original five Georgia-filmed episodes, a Confederate flag along with a checkered racing flag in a criss-cross pattern could be seen behind the rear window; this was removed when it was felt that this extra detail did not show up enough on-screen to warrant the already very tight time constraints of preparing and repairing each example of the car. The name refers to the American Civil War Confederate General Robert E. Lee. The television show was based on the movie Moonrunners, in turn based on actual moonshine runners who used a 1958 Chrysler named Traveler, after General Lee's horse (with a slight spelling change). Traveler was originally intended to be the name of the Duke boys' stock car too, until producers agreed that General Lee had more punch to it. Since it was built as a race car, the doors were welded shut. Through the history of the show, an estimated 309 Chargers were used; 17 are still known to exist in various states of repair. A replica was owned by John Schneider, known as "Bo's General Lee". In 2008, Schneider sold "Bo's General Lee" at the Barrett-Jackson automobile auction for $230,000. An eBay auction which garnered a bid of $9,900,500 for the car was never finalized, with the purported bidder claiming his account had been hacked. The underside of the hood has the signatures of the cast from the 1997 TV movie. Schneider has also restored over 20 other General Lees to date. In 2008, a replica of the General Lee fetched a high bid of $450,000 at the Barrett-Jackson auto auction, indicating the significant interest in the car as a cultural icon. In 2012, the "General Lee 1", the first car used in filming the series, was purchased at auction by golfer Bubba Watson for $110,000. The car had been scrapped after being wrecked during the famous opening jump shoot, and was later discovered in a junk-yard by the president of the North American General Lee fan club. In 2015, following a wave of sentiment against Confederate symbolism in the wake of shootings in Charleston, SC, (relating to photos where the attacker had posed with the Confederate flag), Bubba Watson announced that he would remove the Confederate Flag from the roof of General Lee 1 and repaint it with the U.S. National Flag. The Duke boys added a custom air horn to the General Lee that played the first 12 notes of the song Dixie. The Dixie horn was not originally planned, until a Georgia local hot rod racer drove by and sounded his car's Dixie horn. The producers immediately rushed after him asking where he had bought the horn. Warner Bros. purchased several Chargers for stunts, as they generally destroyed at least one or two cars per episode. By the end of the show's sixth season, the Chargers were becoming harder to find, and more expensive. In addition, the television series Knight Rider began to rival the General Lee's stunts. As such, the producers used 1:8 scale miniatures, filmed by Jack Sessums' crew, or recycled stock jump footage — the latter being a practice that had been in place to an extent since the second season, and had increased as the seasons passed. The 1975 AMC Matador was one of many different Hazzard County police cars used on the series, mostly in the first season; they had light bars and working radios. A 1972 Dodge Polara and a 1974 Dodge Monaco were used during the pilot episode "One Armed Bandits", these were also seen in the show's title sequence. From the second season, the 1977 Dodge Monaco was mostly used. From mid-season four the similar looking 1978 Plymouth Fury was used instead. The Matadors and Furies were former Los Angeles Police Department vehicles, while the Monacos were former California Highway Patrol units. A 1974 Plymouth Road Runner (yellow with a black stripe) was Daisy Duke's car in the first five episodes of the first season. For the last episodes of the first season a similarly painted 1971 model with a matching "Road Runner" stripe was used. In the second season Bo and Luke send it off a cliff in "The Runaway". Another identical Plymouth 1971 model car appeared in the background a few more episodes along with the Jeep CJ-7 until it was finally dropped altogether. Uncle Jesse's truck was a white Ford pickup truck, most commonly a Sixth generation (1973–1977) F100 Styleside. However, in the earliest episodes it had a Flareside bed, and varied between F100 and F250 models throughout the show's run. Bo, Luke and Daisy also drove Jesse's truck on occasion. In 1980, the song reached #1 on the American Country chart and peaked at #21 on the Billboard Hot 100. The series was broadcast by BBC1 in the United Kingdom, debuting on Saturday March 3, 1979 at 9:00 pm (just several months after it began in the US). Popular with all ages (and as some of the more adult elements of very early episodes faded out of the series), it quickly moved from its post-watershed position to a more family-friendly Monday evening slot at 7:20 pm. Soon a massive hit, it moved from Monday evenings to prime time Saturday evening (times varied, but typically around 5:25 pm), where it stayed for a number of years. Later when ratings began to dip (partly caused by the change to Coy and Vance, and partly to do with competition from ITV, with new hit shows such as The A-Team), it moved back to Mondays, making the odd return for short runs on Saturdays. Late episodes also popped up occasionally on Sunday afternoons, and the remaining episodes of the final season were broadcast on weekday mornings during school holidays in the late 1980s. TV Land began to air The Dukes of Hazzard reruns on June 10, 2015, but removed them just three weeks later as a response to the Charleston church shooting and the ensuing debate over the modern display of the Confederate flag. Nationwide, the show also aired on ABC Family (2000–2001, 2004) and CMT (2005–2007, 2010–2012, 2014–15) and TV Land (2015); TV Land dropped the show in the wake of protests and controversy surrounding the display of the Confederate flag. 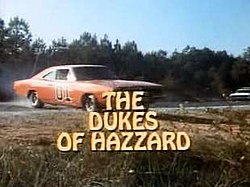 The Nashville Network bought The Dukes of Hazzard from Warner Bros. in 1997 for well over $10 million; not only did it improve the network's ratings, the show was also popular among younger viewers, a demographic TNN had a notorious difficulty in drawing; The Dukes of Hazzard has run either on TNN or sister network CMT ever since. The show ran for seven seasons and a total of 145 episodes. Many of the episodes followed a similar structure "out-of-town crooks pull a robbery or commit a crime or scandal, Duke boys blamed, spend the rest of the hour clearing their names, the General Lee flies and the squad cars crash". In 2014, AutoTrader made a commercial where Bo and Luke shop for a new car while being chased. Also made were The Dukes of Hazzard in 2005 and a direct-to-video prequel The Dukes of Hazzard: The Beginning in 2007.. These films were in the buddy comedy road film in tone than compared to how the original TV series itself was an action-comedy. Warner Home Video has released all seven seasons of The Dukes of Hazzard on DVD in Regions 1 and 2. The two TV-movies that followed the series were released on DVD in Region 1 on June 10, 2008 and in Region 4 on June 4, 2014. In Region 4, Warner has released only the first six seasons on DVD and the two TV movies. The Complete Series and Two Unrated Feature Films box set was released on DVD in Region 1 on November 14, 2017. The TV series was also made available for streaming and download through a variety of services. In 2005, Tom Wopat and John Schneider were reunited during "Exposed", a fifth season episode of the television series Smallville. Wopat guest-starred as Kansas State Senator Jack Jennings, an old friend of Clark Kent's adoptive father Jonathan Kent (portrayed by Schneider). In the episode, Jennings drives a 1968 Dodge Charger—the same body style as the General Lee. Lizard Lick Towing featured an episode with its repossession specialists Ronnie Shirley and Bobby Brantley repossess a General Lee replica. In 2015, in the wake of renewed debate about the symbolism of the Confederate battle flag (which was prominently featured on the General Lee 's roof (and panel behind the rear window in the first five episodes)), reruns of the original series were pulled from circulation. Warner Bros., which owns the property, announced it would also no longer create merchandise bearing the flag, including miniatures of the General Lee,although this has led to people making their own custom General Lees and selling them. Dixie Outfitters in Branson, Missouri on Highway 76 has the General Lee and Rosco's police car signed by Daisy, Cooter, Cletus and Enos. ^ Bidwell, Carol A. (1989). The Conejo Valley: Old and New Frontiers. Windsor Publications. Pages 82-83. ISBN 9780897812993. ^ John Shelton Reed, Southern Folk, Plain and Fancy: Native White Social Types (2007), p. 21. ^ "Basset Hounds". tvacres.com. Retrieved April 6, 2012. ^ a b Hofstede, David (1998). The Dukes Of Hazzard — The Unofficial Companion. Renaissance Books. p. 96. ^ Hofstede, David (1998). The Dukes Of Hazzard — The Unofficial Companion. Renaissance Books. p. 92. ^ The Dukes Of Hazzard — The Complete Fourth Season (The Dukes Story: Building the Legend extra). Warner Bros.
^ Hofstede, David (1998). The Dukes Of Hazzard — The Unofficial Companion. Renaissance Books. p. 97. ^ Hofstede, David (1998). The Dukes Of Hazzard — The Unofficial Companion. Renaissance Books. p. 249. ^ Hofstede, David (1998). The Dukes Of Hazzard — The Unofficial Companion. Renaissance Books. p. 86. ^ Hofstede, David (1998). The Dukes Of Hazzard — The Unofficial Companion. Renaissance Books. p. 100. ^ "Dodge Charger roars to America's most-searched classic car". The ClassicCars.com Journal. Retrieved November 7, 2018. ^ "'General Lee' auction?back on again - May. 11, 2007". ^ "First 'General Lee' sells for $110,000". Fox News. ^ "Confederate flag: Bubba Watson to paint over Dukes of Hazzard car". BBC News. ^ "1974 AMC Matador in "The Dukes of Hazzard, 1979–1985"". IMCDb. Retrieved August 2, 2010. ^ "1972 Dodge Polara in "The Dukes of Hazzard, 1979–1985"". IMCDb. Retrieved August 2, 2010. ^ "1974 Dodge Monaco in "The Dukes of Hazzard, 1979–1985"". IMCDb. Retrieved April 27, 2010. ^ "1977 Dodge Monaco in "The Dukes of Hazzard, 1979-1985"". IMCDb.org. Retrieved April 27, 2010. ^ "1977 Plymouth Fury in "The Dukes of Hazzard, 1979-1985"". IMCDb.org. Retrieved April 27, 2010. ^ "1974 Plymouth Roadrunner — White — Front Angle". Seriouswheels.com. Retrieved April 27, 2010. ^ "jesse's truck - HazzardNet Gallery". Hazzardnet.com. July 18, 2006. Retrieved April 27, 2010. ^ Whitburn, Joel (2004). The Billboard Book of Top 40 hits (8 ed.). Billboard Books. p. 321. ISBN 0-8230-7499-4. ^ "TV Land pulls 'Dukes of Hazzard' reruns amid Confederate flag controversy". WFLA. ^ "Dukes Of Hazzard Off Air Amid Rebel Flag Row". Sky News. ^ Flint, Joe. (October 17, 1997) Divine (TV) Profits. EW.com. Retrieved on August 18, 2013. ^ a b Brooks, Tim and Marsh, Complete Directory to Prime Time Network and Cable TV Shows, page 1253. ^ a b "TV Ratings > 1970s". ClassicTVHits.com. Retrieved April 27, 2010. ^ "TV Ratings > 1980s". ClassicTVHits.com. Retrieved April 27, 2010. ^ a b "27 May 1984, Page 3 - The Akron Beacon Journal at Newspapers.com". Newspapers.com. Retrieved May 3, 2016. ^ a b "28 Apr 1985, Page 59 - The Index-Journal at Newspapers.com". Newspapers.com. Retrieved May 3, 2016. ^ Hofstede, D. (2011). 5000 Episodes and No Commercials: The Ultimate Guide to TV Shows On DVD. Ten Speed Press. p. 91. ISBN 9780307799500. Retrieved November 22, 2014. ^ "The Dukes of Hazzard Ride Again in AutoTrader's High-Octane Campaign". AdWeek. ^ "East & Down's Jody Hill May Reboot Dukes of Hazard At Warner Bros". CinemaBlend. Retrieved May 5, 2018. ^ "The Dukes of Hazzard DVD news: Announcement for The Dukes of Hazzard - 2 TV Movie Collection". TVShowsOnBlu-ray.com. Archived from the original on October 7, 2010. Retrieved April 27, 2010. ^ "The Dukes of Hazzard - Get Them Good Ol' Boys in 'The Complete Collection' 40-DVD package from Warner will hit the street in the U.S. this November". TVShowsOnBlu-ray.com. Archived from the original on September 20, 2017. Retrieved September 19, 2017. ^ "Amazon.com: Dukes of Hazzard Season 1: Philip Mandelker: Amazon Digital Services LLC". ^ Kelly Souders & Brian Peterson (writers); Jeannot Szwarc (director) (November 3, 2005). "Exposed". Smallville. Season 5. Episode 6. The WB. ^ Sloan, Sam (November 3, 2005). "'The Dukes' of Smallville are on Tonight". Slice of SciFi. Retrieved June 6, 2011. ^ "Lizard Lick's most ridiculous repos | Lizard Lick Towing | Dave Channel". dave.uktv.co.uk. Retrieved November 2, 2018. ^ "Confederate flag gets 'Dukes of Hazzard' yanked". USA TODAY. July 1, 2015. Wikimedia Commons has media related to The Dukes of Hazzard.